I just remembered something that occurred when I visited Dymocks bookstore last Saturday. As I walked in I noticed the new Pan Macmillan - Picador 40th Anniversary paperback covers. 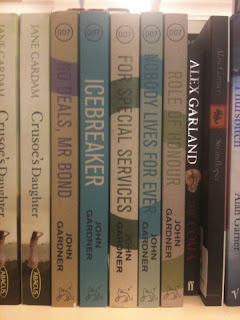 For a second I thought they were the new Amazon Bond covers until I picked one of them up. Looking at the covers again it's probably a bit of a long bow but here they are. - W.H.Smith (new) - had a "3 for 2" sale featuring the "Popular Penguins" including "Casino Royale"
So overall an unsuccessful hunt however it was nice to get out of the house and spend the day togther, plus we walked for about 3 hours so we're a bit fitter now. I would have included some photos but we decided to not take our phones. Sometimes it's nice not to be contactable. 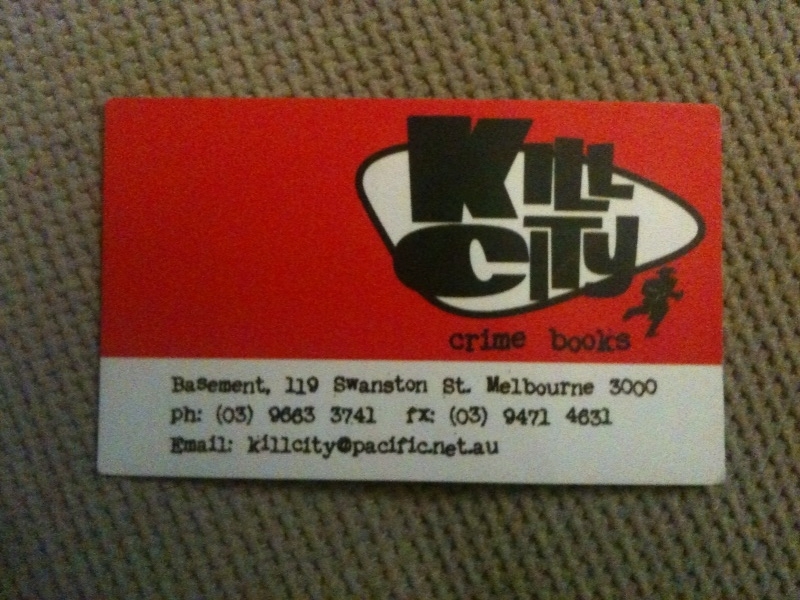 I've included an image of the Kill City business card which I picked up though. On Sunday I caught up with my Dad at a soccer game. He'd been to Baxter with my Mum earlier that day and visited the Baxter Market. Apparently there were a couple of faded Flemings but no luck there either. A couple of weeks ago I visited a second hand store and discovered a hardback first edition copy of "The Book Of Bond" for sale. I've almost purchased a copy of this same hardback in the past only to discover the reversible dust jacket had been attacked by silverfish. Well this time I was more fortunate, so I bought it. Then on Sunday I visited another second hand store that unfortunately was closed. I still took a photo of the shopfront anyway, and then as I was about to leave I noticed in the window display a hardback copy of "Moonraker". I knew it wasn't a first edition, no one would place a first edition dust jacket in a window display in view of the sun, but I was missing this Cape so I rang today for the price. As soon as I found out I spoke to my boss and organised to leave work at 4:30pm instead of 5 to go and pick it up. I received my first novel in the Vintage 007 series today via the post - "Diamonds Are Forever". 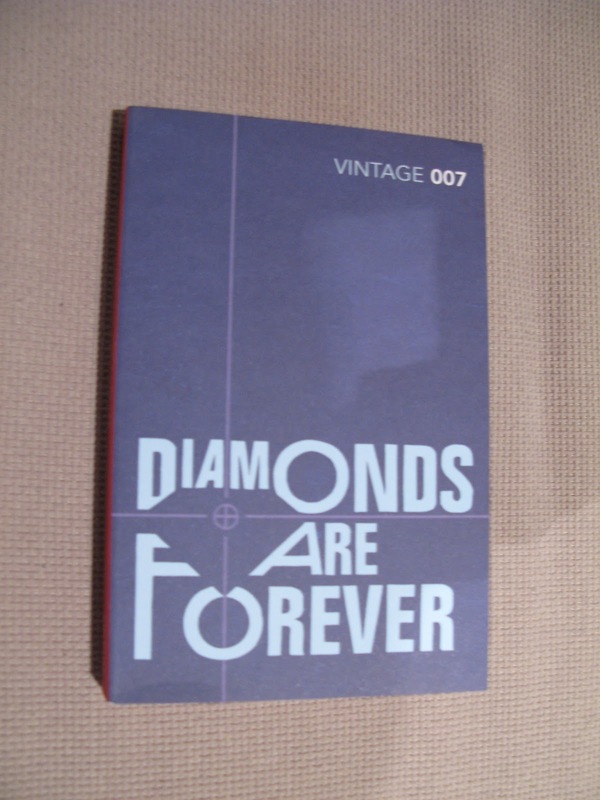 One thing I really like is the last page of the book reads "James Bond will return in From Russia With Love". Great little touch during the 50th anniversary year of Bond on the cinema screen. I also received some bad news today from The Astor Theatre. On Saturday, October 13 they're showing a screening of OHMSS and before-hand there will be a Q&A with Mr George Lazenby. The event has been an anticipated highlight of mine for a while now, especially at the prospect of a photo and autograph with the man himself. I've been telling heaps of people about it, drumming up the numbers. Even my wife said she'd come along (she's never seen the film). But news came through today that while Mr Lazenby will still be participating in the Q&A he will no longer be available to sign autographs or participate in any photos. Mr Lazenby is appearing at the Armageddon Expo 2012 that same day in the City so that might be the only way for me to grab a photo and autograph. I found another new Young Bond novel today with a cover illustrated by Kev Walker. Only three to go in this series now. I've added this series to the website. It's taken a while but the new John Gardner reprints are finally appearing on shelves in Australian stores.